The weather’s getting colder, and that means it’s time for heartier French cuisine. I’m a big fan of French winter classics, like boeuf bourguignon, cassoulet, soupe a l’oignon and other tummy-warming dishes. 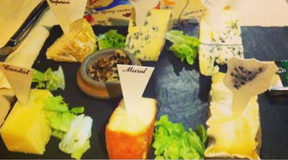 And you can find these tasty concoctions at many restaurants throughout Paris. 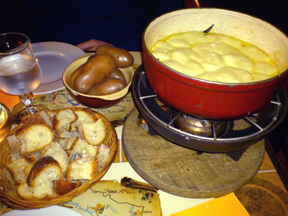 Oddly, though, one cold-weather dish is rather difficult to find in the City of Light—fondue. OK, fondue is not French per se, but given that France is world-famous for its cheese, it’s not really a stretch for visitors to Paris to hope to find hot, gooey, melted cheese on at least a few restaurant menus. 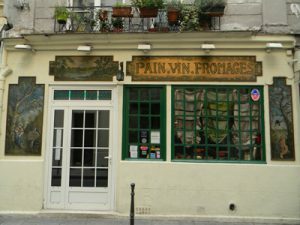 Fortunately, there’s a fantastic cheese-centric restaurant in the heart of the Marais that offers up some of Europe’s very best fondue throughout the year—Pain, Vin, Fromages (translated to Bread, Wine, Cheese). 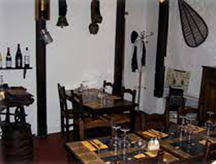 The rustic, farmhouse-like restaurant, just a block or so from the Pompidou Center at 3 Rue Geoffroy-l’Angevin, offers six kinds of cheese fondues, priced from 15 to 17 euros per person: Savoyarde (with emmental, beaufort and comte cheeses, mixed with white wine, kirsch, nutmeg, garlic, salt and pepper); Indienne (the Savoyarde plus curry spice); Meridionale (the Savoyarde with tomatoes and herbes de Provence); Normande (a mix of camembert, pont l’eveque and livarot cheeses, with creme fraiche, calvados, garlic, pepper and a four-spice blend); Seguin (with chevre and camembert cheeses, plus calvados, creme fraiche, garlic, pepper and cumin); and Roquefort (with Roquefort and camembert cheeses, plus calvados and creme fraiche). Two “meat” fondues—in which diners cook their own pieces of meat in fondue pots filled with hot oil or wine—include the Bourguignonne (with 250 grams of shaved meat, salad and various dipping sauces); and the Vigneronne, which uses hot red wine instead of oil for cooking. And while all of the fondues served at Pain, Vin, Fromages are excellent, I’m drawn time and time again to two other winter classics that are perfectly crafted at the phenomenal restaurant—tartiflettes and raclette platters. 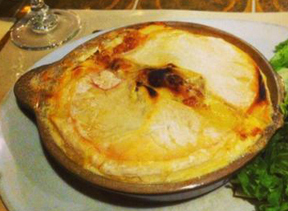 Let me start with my favorite, the tartiflette. This wonderful baked meal is a one-pot dish containing potatoes, reblochon or muenster cheese, potatoes, bacon, onions and creme fraiche that’s baked until bubbly and lightly browned on top. It’s almost like over-the-top scalloped potatoes, only much creamier, much cheesier and much, much tastier. And while you can order it any time of the year at Pain, Vin, Fromages, tartiflette is most definitely designed as a winter meal—it’s very warm, very filling and very heavy. It’s also a savory slice of heaven. Raclette is often served as a melted cheese sandwich (although not at Pain, Vin, Fromages): Wheels of Alpine valais raclette/fromage a raclette cheese–a cheese produced both in Switzerland and in the Alpine areas of France–are warmed under a heat source, then the melted edge is scraped off into (or onto) sliced bread, typically a baguette in France. It’s hugely popular in the areas of France where the cheese is produced, but it also can be found at most of Paris’s Christmas markets each November and December. Pain, Vin, Fromages offers a more refined raclette: Instead of melted rounds of cheese, little cast-iron pans are filled with raclette cheese, spices and in some cases meat like bacon or ham, then placed under an oven broiler until thoroughly melted. 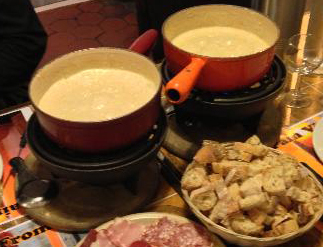 Six raclette dishes are offered: Jambon de Bayonne (cheese, potatoes and Bayonne ham); Jambon Blanc (cheese, potatoes and boiled ham); Viande des Grisons (cheese, potatoes and dried beef); Bacon Rosette (cheese, potatoes and bacon); Religieuse (only cheese and potatoes); and Gourmande (cheese, potatoes, bacon, Bayonne ham and dried beef. Raclettes are priced at 13.50 to 18 euros per person. Note the “per person” indicator when describing Pain, Vin, Fromages fondue and raclette dishes. This leads to my only gripe about this otherwise splendid Marais restaurant. Pain, Vin, Fromage also offers 10 different cheese plates, including six broken down by French region so you can taste the best of what each unique area of France offers; and a fine selection of charcuterie. An impressive and extensive wine list also has been assembled be talented sommelier Vincent Durand. Reservations are recommended at all times, although diners often have luck snagging unreserved tables on weekdays. But don’t even think about that on weekends; you’re bound to be turned away as this fondue-focused eatery is hugely popular with both locals and tourists. Pain, Vin, Fromages is open daily from 7-11:30 p.m. It’s a very short walk from the Rambuteau Metro station. Hours: Daily, 7 p.m.-11:30 p.m. 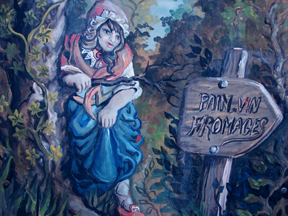 This entry was posted in Food, French cuisine, Marais, Restaurants, Right Bank and tagged cheese, fondue, Pain Vin Fromages, raclette, tartiflette by Bob Adams. Bookmark the permalink.